Well, that was a bit of a letdown. 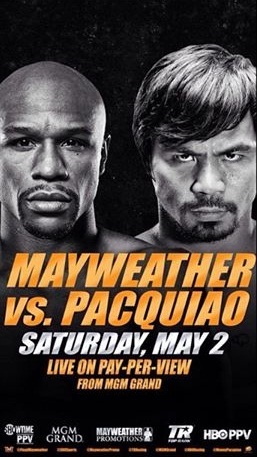 The May 2nd Pacquiao versus Mayweather “Fight of the Century” couldn’t even manage to be fight of the night. But in fairness, that sort of thing is actually pretty common. Hugely hyped fights from the recent past often turned out to be relative duds. Mayweather’s 2007 fight with Oscar De La Hoya was fairly underwhelming. Lennox Lewis versus Mike Tyson was a one-sided beating. Oscar De La Hoya versus Felix Trinidad was a snoozer (as well as a minor robbery). And so on. Sometimes the pressure can throw fighters off. Sometimes two fighters styles and skill sets just don’t match up in a fan friendly way. Sometimes one fighter either outclasses the other or completely nullifies them. But it always feels like a disappointment. Especially for someone who dropped $100 on the pay-per-view. This weekend was a mixture of those prior disappointments. The fight was not a mismatch by any means, and it was reasonably competitive. But it was fought at a slow pace and both men appeared to lack passion, especially in the later rounds. The slow pace favored the taller, more technically sound Mayweather. My original prediction (a narrow Mayweather decision) was predicated on an active Pacquiao, and a Mayweather who would be willing to make a statement and engage, at least early on. Other than an early ineffectual rush, Floyd fought even more negatively than he normally does. And Manny rarely cut the ring off, and spent quite a bit of time moving and not throwing. The whole event, especially after the 8th round, felt anticlimactic. Round 1 was a clear Mayweather round, with Floyd coming out reasonably strong, throwing a bit more, and making Manny defend. Both avoided shots well, and neither connected with anything significant. The second round was a bit better for Pacquiao, and one could make a case for him edging the round, but again, neither did much. Floyd spent most of the round moving backward, and Pacquiao stalked, but rarely threw when he had Floyd up close. The 3rd round was a classic Mayweather round, moving, jabbing, clinching, and landing counter rights with enough force to be felt, but no real malice behind them. Pacquiao picked up the pace more in the 4th, displaying good head movement, working at angles, and it paid off. A big left hand wobbled Floyd and sent him to the ropes. Manny flurried, mostly missing, but also landing some decent body shots. Then, with Mayweather passively shelling up, Manny inexplicably eased off the gas. He won the round clearly, but to my eyes, it set a tone for the rest of the fight. Even when he had a good moment, he didn’t press to capitalize. Mayweather moved more in the 5th, rarely throwing punches, and clinching frequently. However, Pacquiao was content to follow him around without much apparent gameplan. Pacquiao only threw 17 punches the entire 5th round, after throwing 50 the round before. One couldn’t help but think the Pacquiao of 2009 and 2010 would have been more willing to throw caution to the wind and fire 60 or 70 shots per round, making Mayweather work. Pacquiao pushed harder in the 6th, landing a few decent straight lefts. This gave Mayweather more opportunities to counter, and he did so, catching Manny with solid jabs, although not much else. Pacquiao’s power and handspeed appeared to bother Floyd, but the 6th round seemed to mark the last round he was willing to employ it. A good straight left got through and made Mayweather do his “you didn’t hurt me” headshake, which is a good sign (along with suddenly stiffened legs) that he was indeed hurt. The 7th through 9th rounds were pretty much the same. Floyd moved, clinched, and occasionally landed right hand leads. Manny followed without much purpose, and every 15 seconds or so, threw and missed a right hook or left cross. Manny woke up a bit in the 10th. Floyd was coasting, and Manny slightly outworked him in the round to take it on my card. Despite being well-behind on the scorecards, Manny eased off even further in the 11th and 12th. Mayweather pretty much won those rounds by default. Pacquiao never displayed the urgency needed to wrest control of the fight back in his favor. The scores of 116-112 twice, and 118-110 were reasonable. The wider score was too wide to me, but I get why someone saw it that way. It was definitely a disappointing fight to watch, as a boxing fan. Even moreso, it did little to encourage casual fans from taking a closer look at the sport. It would have been nice if a fight like Matthysse-Provodnikov would have been on the undercard, to help highlight to casual fans how good the sport can be. Neither Floyd nor Manny fought as if they cared about entertainment. Certainly, the concept of “win this time, look good next time” applies, but on this sort of stage, the performance matters. Before I come down too hard on either man, I want to acknowledge that they both were in with the best opponent of their career. Floyd made it clear that his non-engagement was due in part to the physical risks Manny brought in to the ring. Manny was facing a defensive expert who happened to be larger than him, and equally experienced at the elite level. Not to mention Manny’s possible pre-fight shoulder injury, which, if true, would obviously have hampered his performance. I want to go over some basic points from the fight. What worked for each man, and what didn’t. What did we learn about either fighter Saturday night, if anything? As always, Floyd’s defense was excellent through most of the fight. He didn’t stand in the pocket, blocking and countering like we’ve seen in the past. Diminished reflexes and an explosive opponent dictated that he use his legs and reach instead. And that’s what the master tactician did. He did a superb job of maintaining distance and dictating the pace. Some of that may have been helped by Manny’s hesitancy, but it worked regardless. Floyd landed just enough right hands to edge most of the rounds. Only two rounds seemed clear for Manny, with maybe 3 more swing rounds. Mayweather clinched frequently, but did so in an intelligent manner, making sure to keep Pacquiao from getting his hands moving. Floyd spent the entire fight doing just enough. He rarely punctuated the rounds with emphatic attacks. From the perspective of just caring about the end result, it worked. However, he did have a strangely passive Pacquiao in front of him, and he seldom took advantage of the lack of incoming fire. Floyd’s workrate was anemic, even by his generally low standards. His average output over his prior 13 fights amounted to 17 punches landed out of 39 thrown per round. His 12 out of 36 line Saturday night may have been due to Pacquiao’s tactics as well as respect for Manny’s strengths. But it still kept the fight closer than it needed to be. This complaint is really only an issue if one cares about HOW Floyd got the win. And opening up more would have encouraged a firefight, which, based on how Floyd reacted to the few lefts he took, would not have been in his best interest. Not much. The mere threat of his vaunted offense prevented Floyd from attacking, which meant that Floyd’s offense was extremely limited and he didn’t land much on Manny, especially early on. At points in the middle rounds, Manny managed to cut the ring off and get Mayweather on the ropes. Big left hands visibly stunned Floyd in the 4th and 6th rounds. Otherwise, the best you can say about Manny was that he had moments of effectiveness. I scored 4 rounds for Pacquiao, and an extremely generous judge might argue in favor of a 5th. Otherwise, there weren’t many positives for the Congressman. You could also complement Pacquiao’s defense, if you wished to find something else positive. Mayweather’s connect percentage of 34% was significantly lower than normal, due in part to Manny’s own lack of aggression, as well as decent head movement. Manny did a good job slipping the jab, though he did eat a number of right hands, albeit not all flush. Where do we begin? There were multiple issues with Pacquiao’s performance. Jabs. Manny only landed an average of 1.5 jabs per round, out of a mere 16 thrown. Floyd has shown a bit of a vulnerability in the past against a quick jab, especially when thrown in volume. The jab is the key to setting up the offense. The jab also helps to close distance, which Pacquiao badly needed. Manny neglected the jab, possibly out of concern for eating counters, or possibly due to a shoulder injury. Either way, without the jab, the other punches in his arsenal lacked a proper set up, and were easier to avoid. Activity. Manny landed, according to Compubox, a mere 81 out of 429 punches in the fight, for a paltry average of 7 out of 36 per round. He threw 50 punches or more only twice. By comparison, in his 12 fights before this, Manny landed an average of 22.6 punches landed per round, out of 65.5 thrown. Both numbers are above the welterweight average. In fact, before the loss to the Marquez in 2012, Manny had been averaging 24 out of 69 per round as a welterweight. Some of that can be attributed to Mayweather’s constant movement. It’s not wise to throw recklessly when one is constantly out of punching range. This is understandable. But there were still multiple moments, especially in the first half, where Pacquiao had Floyd against the ropes, and he still hesitated to open up. Age and wear are likely a factor. Saturday night marked Pacquiao’s 65th professional fight over a 20 year span. Many of those fights had been absolute wars. Even in excellent shape, that kind of career will wear down anyone. Footwork. Much was made before the fight of Manny’s fast feet and underrated footwork. Indeed, against opponents who came at him or stand their ground, Manny is very good at positioning his feet and getting himself good angles to land his combinations. However, Floyd didn’t cooperate, thanks to his near-constant movement. Manny got close a few times, but only successfully cut the ring on a couple occasions. Most of the time, he plodded after Floyd, seemingly waiting for Floyd to stop moving… which wasn’t going to happen. Aggression. Realistically, we couldn’t have expected as much here as say, 5 years ago. Manny hasn’t really demonstrated the ferocity that marked the first 2/3 of his career since his massacre of Miguel Cotto in late 2009. Perhaps his 4th fight with Juan Manuel Marquez, but that ended up with him walking into the right hand from hell. There was hope that the challenge of Floyd Mayweather would be enough motivation to reclaim some of the malice of old. Other than a couple decent flurries, though, Manny seemed more frustrated and passive than anything else. Like his activity, the lack of aggression was likely a mixture of age and wear, as well as a generally more peaceful mindset in recent years. He also may have been suffering from a torn right rotator cuff, which would certainly explain the lack of jabs and overall low activity level. Floyd’s constant movement had to be a contributing factor, too. However, Chris Algieri ran even more blatantly than Floyd, and Manny still forced the fight and closed the distance enough to earn the decision. Chris Algieri is certainly no Floyd Mayweather, of course. But that should be an indication that movement and distance was only one part of the larger equation. No matter how one analyzes it, Floyd Mayweather definitely won the fight. He used his footwork, sense of timing and distance, and just enough right-hand leads to keep a strangely passionless Pacquiao at bay for most of the night. I would hesitate to call it a dominant performance, though. Floyd did just enough to win, but he never had Pacquiao hurt, and almost never landed more than one punch at a time. At times in the middle rounds, it appeared as though Pacquiao could have changed the tone of the fight, but he never quite opened up the way he needed to. After the fight, Pacquiao claimed that he believed he won, an opinion shared with Evander Holyfield and pretty much nobody else. The winner cements himself as the number one pound for pound fighter in the world, as well as the linear welterweight champion. Oddly, it’s difficult to find too many fighters who would leapfrog Pacquiao for the number 2 spot, even with his mediocre performance Saturday night. The elite levels of the boxing world are wide open right now. It looks to these eyes that neither man has much desire left in the fight game. They both have accomplished pretty much everything that there is to accomplish in the sport. They both have made hundreds of millions of dollars. They both are likely among the 30 or 40 greatest fighters in history, and I rank them 2 and 3 of this era, assuming “era” is loosely defined as boxers who have fought most of their most significant fights after 2000 or so. There’s some overlap in that definition, and eras tend to bleed into each other. But for my money, Bernard Hopkins counts as part of this era, and has accomplished more in his career than either Mayweather or Pacquiao. Nonetheless, being in the same tier as the Executioner is no small praise. All three are surefire Hall-of-Famers, and at least deserve to be in the discussion with other legitimate all-time-greats. There doesn’t seem to be much left for either man. Floyd has one fight remaining on his Showtime contract, which he has indicated he will honor. There aren’t many compelling options for him, though. Amir Khan has been pleading for a shot for years. But Mayweather plans on fighting in September, which would conflict with Khan’s schedule and training around Ramadan. Kell Brook, Shawn Porter, and Keith Thurman are all reasonably attractive options, and would likely all jump at the chance. Rematches with Miguel Cotto and Canelo Alvarez are all conceivable fights, and winnable for Floyd. Manny’s situation is a bit tougher. He’s starting to run low on new opponents at welterweight to fight, at least ones that aren’t being managed by Al Haymon. He also may need surgery for his shoulder, which would most likely keep him out of the ring for the rest of 2015. He clearly has slowed down, and doesn’t have the same fire that he used to have. It’s possible he could be fired up by dropping back down to 140, where Lucas Matthysse and Terence Crawford make for intriguing fights. No matter what, Manny has a life outside of boxing, which has encroached further and further on his attention. Retirement looms for both men. In the meantime, we can now at least say they fought. Would the fight have gone differently 5 years ago? Many say no. They see a younger, quicker Floyd keeping his distance even more easily, and preventing the Filipino whirlwind from launching any sort of sustained attack. On the other hand, Manny circa 2010 would likely not have been discouraged by early struggles, and would have been throwing 70 or 80 punches a round for the entire fight. Considering that he visibly staggered Floyd the few times he opened up this past weekend, it’s not unreasonable to think he could have overwhelmed Mayweather back in 2010. It’s speculative either way, of course. Intellectual masturbation at best. Boxing does thrive on hypothetical situations, though. And at the very least, it’s fun to think about, and will fuel debate for decades to come. But for now, the debate is over, the fight is in the mirror, and hopefully we can get back to other talents who are making inroads in the sport. This entry was posted in boxing, fight report, pound-for-pound and tagged all-time ranking, analysis, boxing, decision, fight report, floyd mayweather, letdown, manny pacquiao, post fight, pound-for pound, unanimous decision, welterweight. Bookmark the permalink.